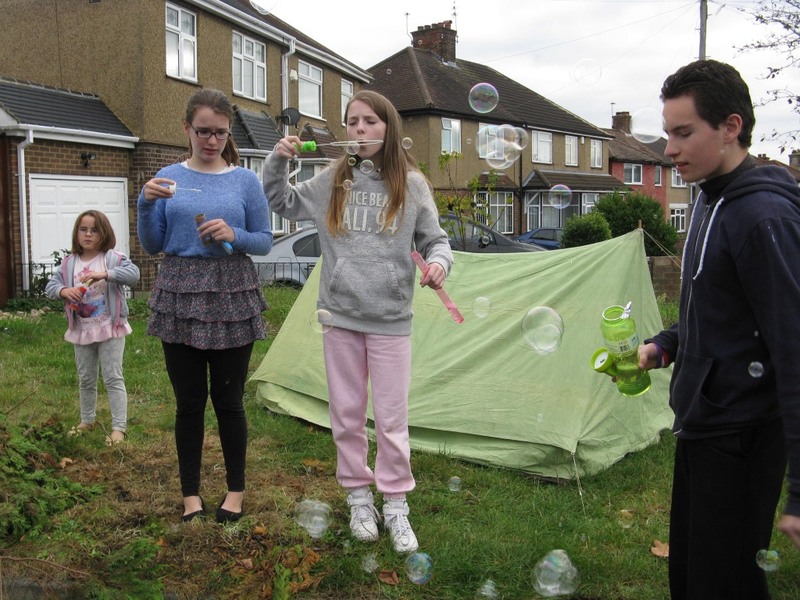 *Lorraine Lutman of the Blean Congregation died last week as well and her funeral is Friday 7th November. *Ivy Griffiths of the Cardiff Congregation died at age 91. Ivy has been a member of the Church since 1962. *Next week our Service may have a number of visitors in the area for the Denominational Conference at Allum Hall on Sunday beginning 10am. At our Service here next Saturday Mrs. Tammy Tkach and Mrs. Cathy Deddo will be speaking. 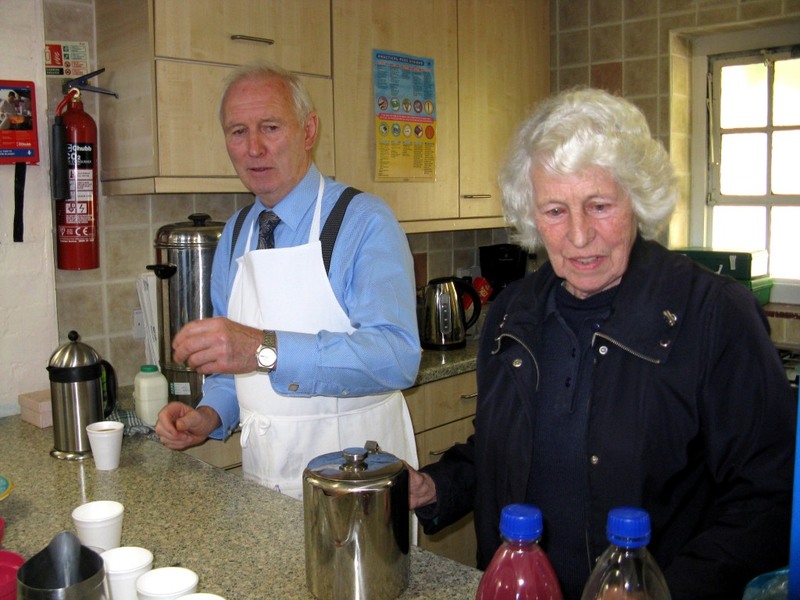 After Church lunch will be available in the Church Hall. *The Clocks go back tonight. 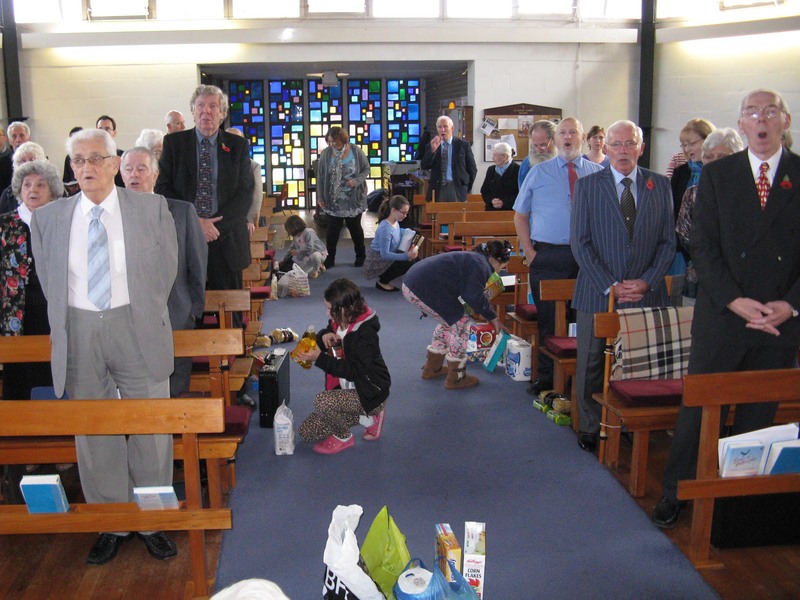 During this hymn the children were invited to come up the centre aisle to bring the donations of non-perishable goods to the front. 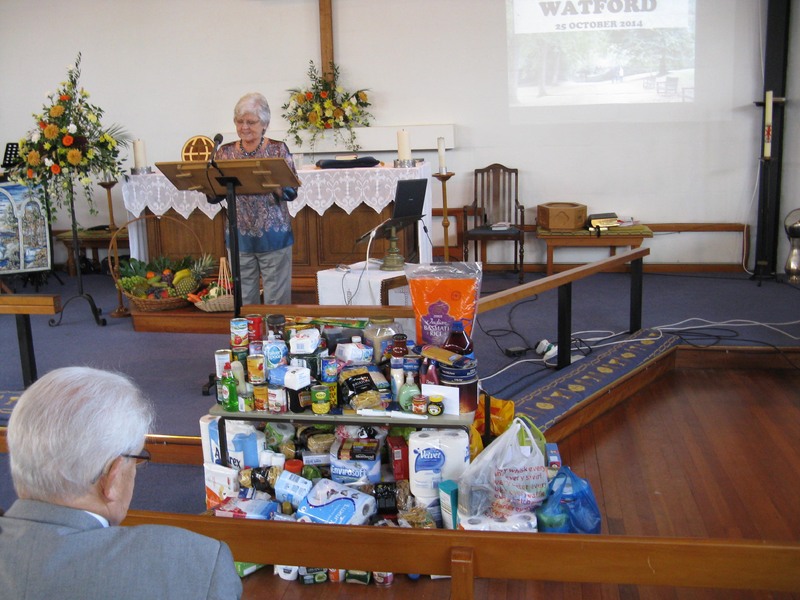 The items were taken to New Hope, a charity to feed and help the homeless in Watford. 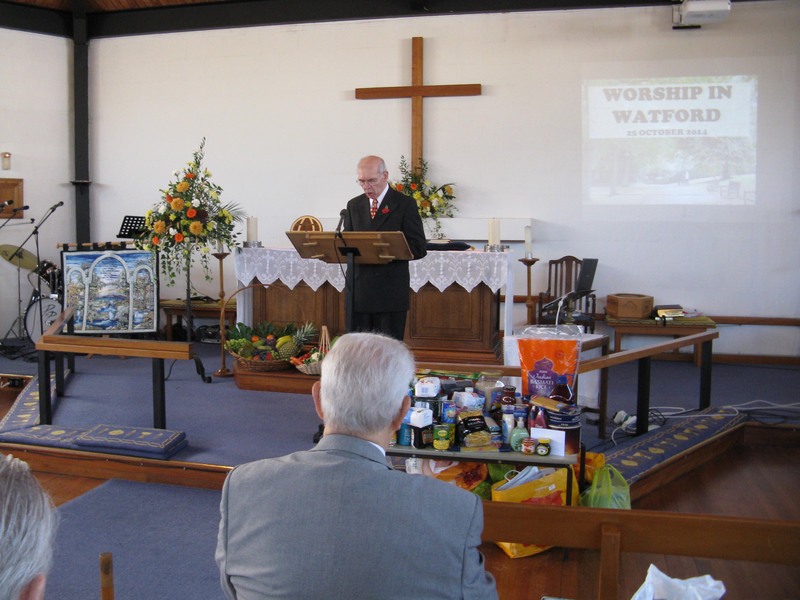 *We are abundantly blessed for which we give thanks and thanks also that we have this opportunity to share with those in need with our harvest Service collecting for New Hope. We represent you in this nation. Help us reflect Jesus in what we say and do. *Thank you for our daily bread and thank you that we can share but even greater for our spiritual food and ask that you guide and help us to share you with a hunry world. 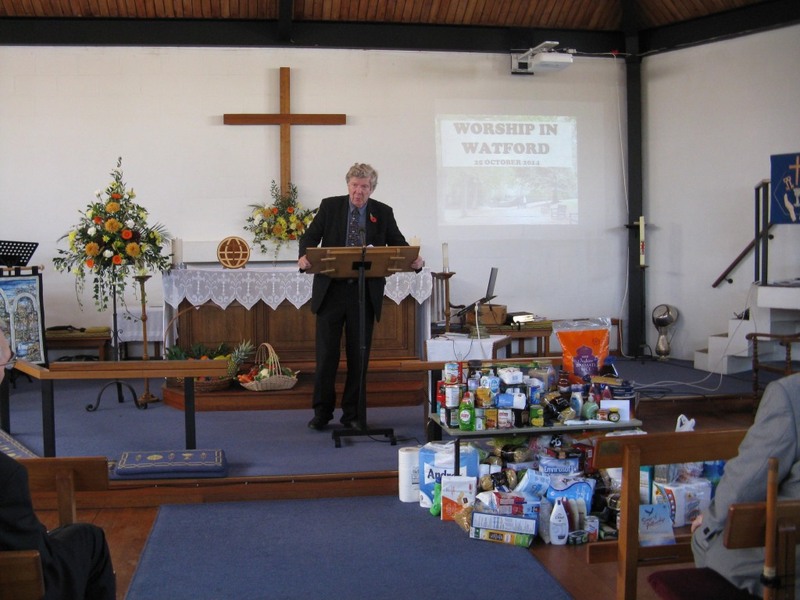 The Sermon was given by David Silcox. We looked at the cripture in Matthew 11:28-30 which says come unto me all ye that are burdened and heavy laden and I will give you rest for my yoke is easy and my burden is light. It says my yoke is easy—doesn’t do away with the yoke. A yoke ties two together to pull a burden and Jesus says MY yoke—he pulls together with us. Jesus goes on to say my burden is light—he doesn’t say we will have NO burdens. When we come to him we give him our previous burden of sin, anxiety, sickness, bereavement, poverty and our many burdens. He doesn’t remove our trials and burdens but comes alongside to give us peace and joy. His love casts out fear and his hope makes our burdens bearable. At the Young People’s Church on the 25th of October, the voyage of Paul to Rome was considered. A globe and various maps were looked at to help plot this journey. The shipwreck on the island of Malta along with the snake bite Paul received there were read from the Bible. Paul’s encouragement to obtain the ‘prize’ in a race in 1 Corinthians 9:24-25 was also discussed. As Paul, Aquila and Paul were tent makers, the young people put up a tent on some grass next to the Church. They also played with some bubbles. 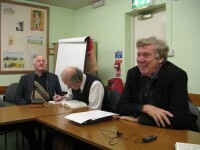 The Bricket Wood Bible Study began again in the St. Stephens Parish Centre at 7:30pm on Friday night 24th October. We are continuing to look through the book of Psalms with an eye out for messianic passages. This evening we began the longest chapter in the Bible, Psalms 119, which is an acrostic using the letters of the Hebrew alphabet. We enjoy refreshments and fellowship after the study each week. Why not come along and join us for this fortnightly study of the scriptures? The next study will be 7 November.